What Pots Are Made Of. 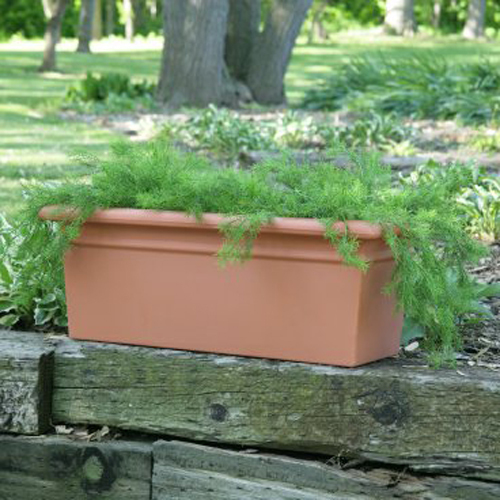 All garden planters are made of a variety of materials. Some will suit your garden and planting needs and others not so much. 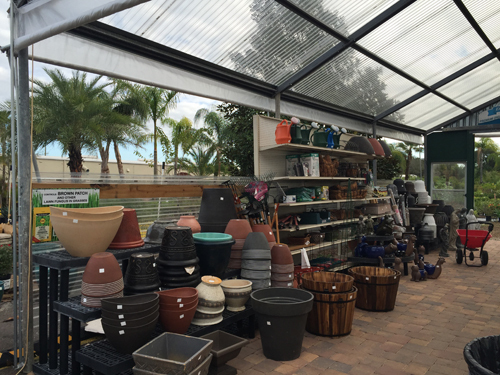 Keep in mind when looking at your choices that you will need a planter that is large enough to support the plants growth. You don't want to have to repot in one growing season. Also, make sure that you have a drain hole. Even if you are planting cactus or succulents which don't need a lot of water you still don't want their roots to be sitting in standing water. Clay: Clay pottery has been around for decades. They are the most healthiest materials because they breathe which is good for the plants roots. There are different qualities of clay like Italian, Mexican and Chinese. Some use powder products and others are harvested out of the ground. Clay will break down fast and are very fragile and easy to break. They also need to be watered more because they dry out faster. There are high fired clay's now that will wear as well as a glazed planter so look for those if possible. Poly Resin: Lots of large sizes because they are poured into a mold to cure and don't know a kiln to be fired in. Lots of colors and attractive styles. Our commercial grade poly resin is super durable and guaranteed not to chip, warp, crack or fade over time. One bonus is the shipping, moving and storing of poly pottery. It's lightweight will nest easily and you can move them around on a whim. Glazed Ceramic: Colorful with shiny and matte finishes, glazed pottery is know for it wonderful glazes and finishes. Durable enough to handle a heavy frost but not enough for below freezing temps. They are heavy and moderately expensive. When you need to add color to your garden or patio area then this is the way to go. Concrete: Durable, attractive and affordable. There are good manufacturers and not so good one so be selective. It will all depend on the concrete mix that is used on how well they will wear. Lots of color choices, and optional drain hole choices. Obviously you want them placed where they will stay because moving them is not an option. Metal: Lighter weight, durable but unless powder coated they will rust. Many like that rusty look and prefer it to a colored finish. 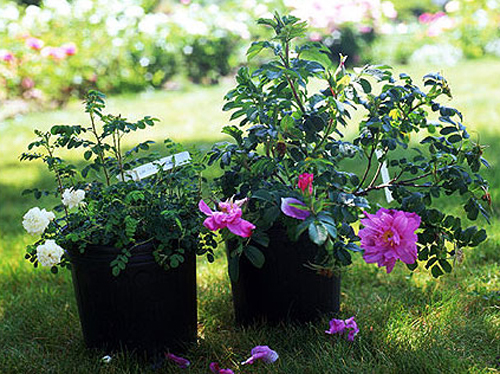 Plastic liners will help insulate them and keep the roots from overheating during the summer months. They come large and extra large which comes in handy for commercial applications. So, no matter what you choose try to find a material that will serve your needs. How thirsty are your potted plants? 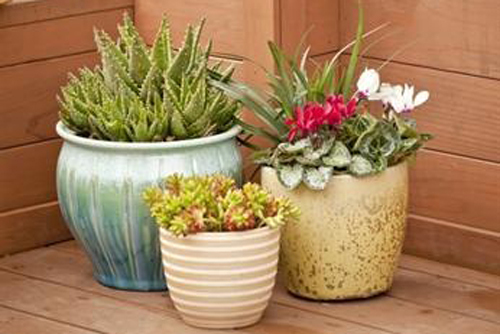 Potted plants growing in garden containers are at your mercy when it comes to getting the right amount of water. Unlike plants growing in the ground that can rely on deep roots to get them through dry spells, container grown plants have limited soil from which to drink. On the other hand, if container grown plants are left to sit too long in saucers full of water, the roots can die from lack of oxygen. It comes down to this. If you want to be successful growing plants in garden containers, that is, if you want flowers to bloom well and your fruits, herbs & veggies to produce a bountiful harvest, you have to be an attentive & efficient waterer! When asked " How often should I water my plants" there is no easy answer. It always involves several factors. 1. Consider Location: Planted pots under eaves or a dense tree may be deprived of rain. Stand next to your containers and look up, can you see the sky? Obviously pots on a covered porch must receive all their water from you because they are out of the rain. 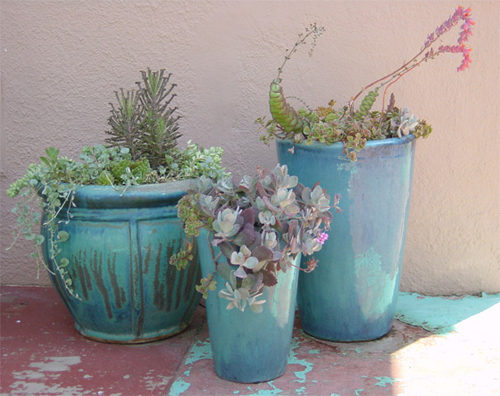 All containers placed in full sun need frequent watering plus consider if the surface they are on is concrete. If so they will dry out faster than a wood deck which tends to stay cooler. 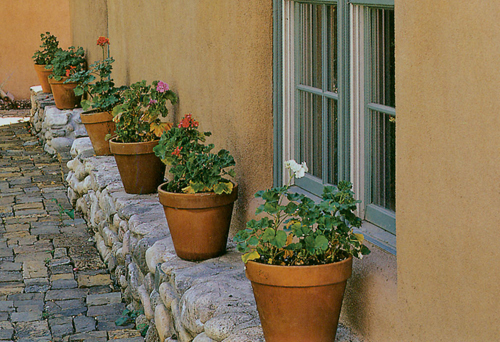 Pots near a light colored, south facing wall, which reflects light & heat will dry out faster than those farther away. 2. Climate & Weather: Climate is determined by where you live. If you live in Seattle where it is humid and has a lot of rain, watering isn't a constant chore. In drier, hotter areas like Phoenix, watering would be a daily even twice daily chore. Weather is what is happening RIGHT NOW! Pay attention. 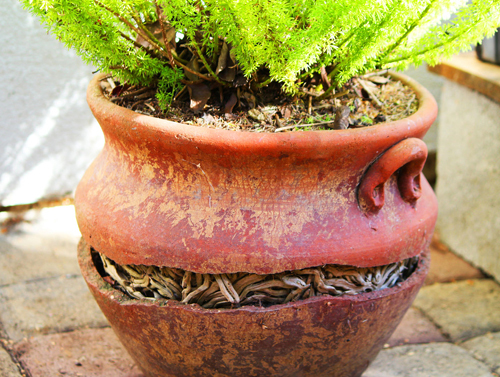 Hot winds on cloudless days can dry out a hanging pot in a matter of minutes. 3. 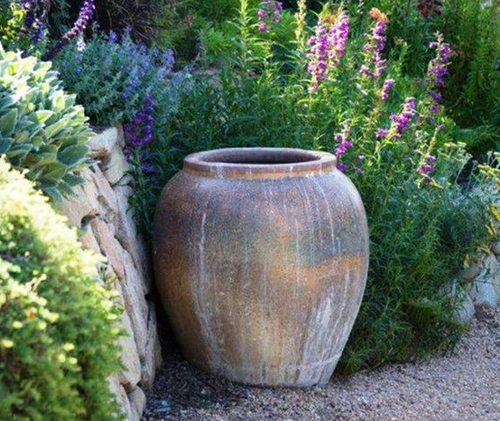 Pot Type & Color: The porosity of containers influence how much water evaporates through it's sides. 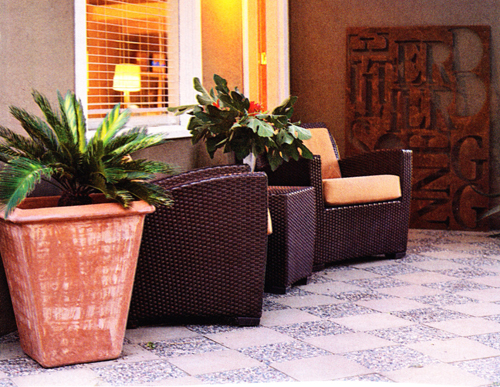 Terracotta is meant to breathe and is more porous than a poly resin or concrete planter. Lighter colors also reflect sunlight and dry out more slowly than darker colored ones, which absorb heat. 4. 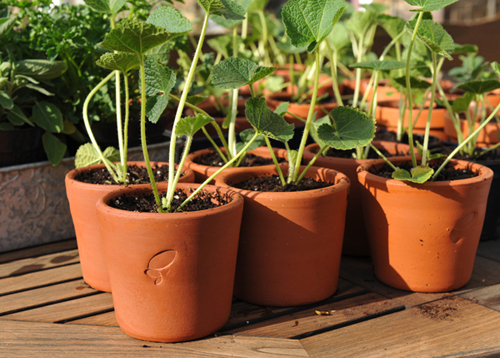 Soil Variations: Potting soils used in containers are formulated for good drainage, which means they dry out quickly. So read the bags when visiting your local nursery or check back on this blog for recommendations in future posts. 5. 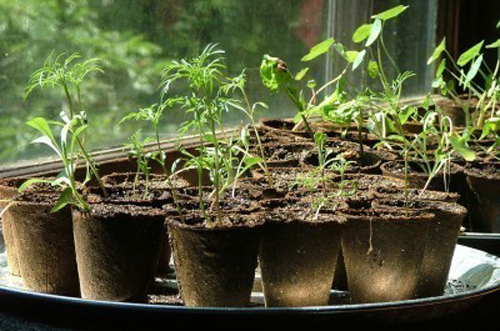 Root-boundedness: Plants grown in containers have roots that become more crowded as it grows. This requires more water. At this stage it is easy to over water plants. As plant roots continue to grow the organic matter in the pot mix breaks down, the containers more roots than soil. The plant is root bound and the root ball can be difficult to keep moist. The is the time to transfer to a larger planter. Whether you have experienced any of the conditions listed above or something we may have missed, don't hesitate to comment here. Still Talking Terracotta Pottery Tips! 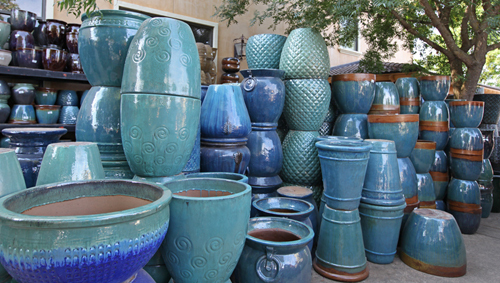 Arizona Pottery imports clay garden pottery from around the world. 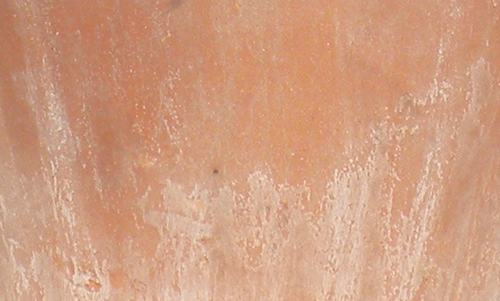 In this post we will refer to Chinese Clay Pots. As we stated before Italian terracotta is the best in the industry. Lightweight, wonderful color and great firing process. 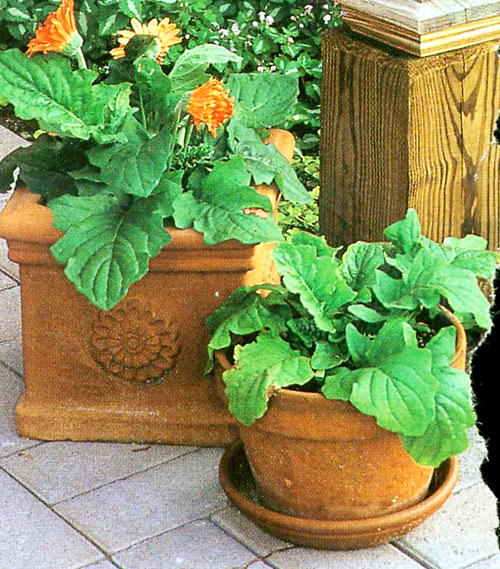 Chinese terracotta flowerpots are made of a very heavy, thick clay. After the planters are formed by hand and fired in a mud hut they will have a very rough texture to them. If you rub your hand down the side, it will feel uneven and scratchy. Because of the clay mix you will also see a whitewashed finish. It looks like a powder coating but what it is showing is the calcium that is in the clay. It turns whitish when fired. If you seal these pots, which we recommend, it will darken the clay up and not be as noticeable. Because these Chinese clay pots are very porous they will absorb a lot of moisture and will contribute to a faster deterioration of the clay. Of course this is where sealing again will help to prolong the life of the clay. On a scale from Best to Worse - Chinese terracotta pottery is considered middle of the road. Even though it's rough it comes in some super decorative designs. You will see hex pots, lots of garlands and details. They aren't as defined as the Italian pots but are still unique. We love basket weaves, cherubs, and medallion embellishments. Seal these planters, store them for winter if possible and you will be very pleased with their performance in your garden for years! [Read more] Plant thru the pain. [Read More] Do it yourself backyard. 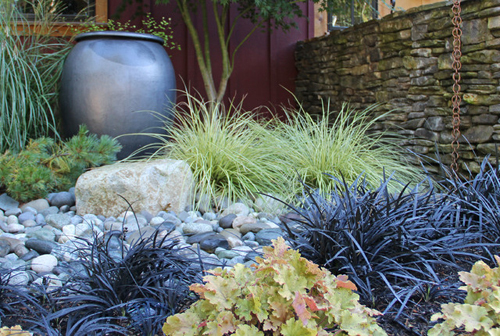 Design in advance: Once you hit the nursery to select your plant materials, try to create the look you hope to achieve BEFORE you purchase them. Group the plants together on the pavement or get a cart. Combine colors, styles, and sizes to create a beautiful and cohesive look. 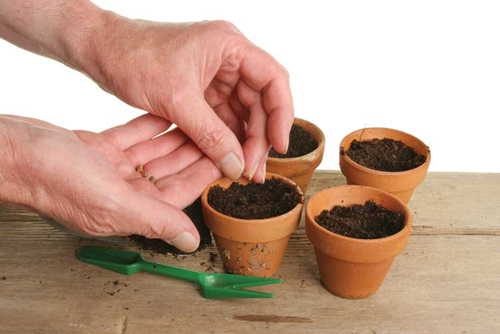 Make the arrangement in small groups and then set them aside and move on to the next pots arrangement. Don't get overwhelmed or try to do the whole yard or patio in one trip. You can always go back for more plants. More is better: Don't just put one plant in your patio planters. A single plant looks sparse and lonely. You have a choice of planting several different types of flowers or even multiple quantities of one type but a single plant is not very attractive. We personally like the look of multiple types, heights, colors etc. It just gives the container more character. Group containers: Try placing multiple containers together in groups or even at different heights. Elevating pots with pot stands really changes up the look. 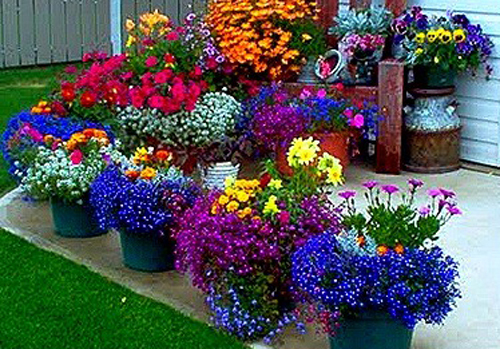 Use racks, hanging pots, lots of colors and different types of planters. 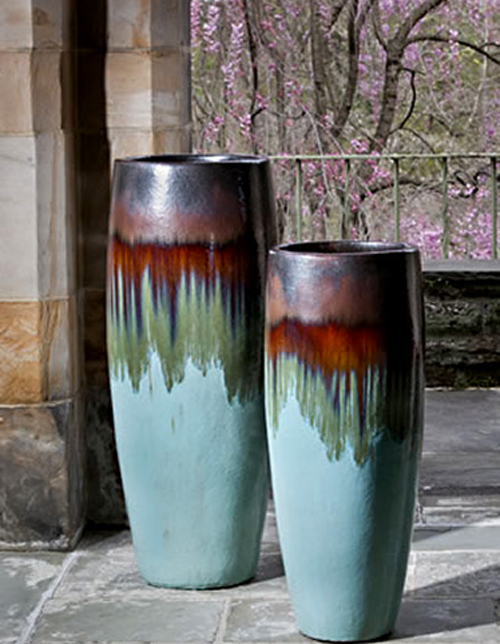 Terracotta, glazed, colored, shiny, matte and lightweight or concrete. Pot Placement: Make sure you don't place the pottery where people will trip over them. They should be secured if placed on a ledge where they could be pushed off and get damaged or hurt someone. Always try to go to the edge of patios, safely away from doorways and sidewalks. 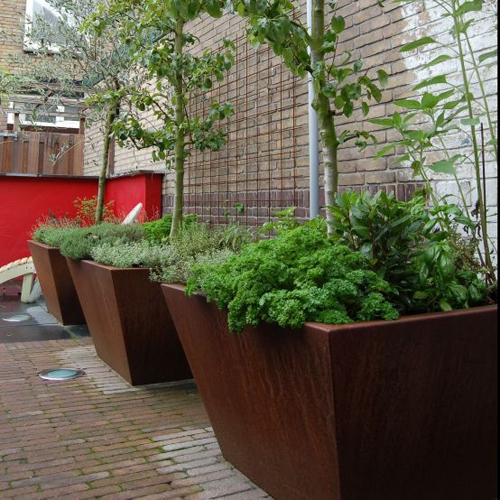 Line the planters up against a wall or fence where they won't be in the way. 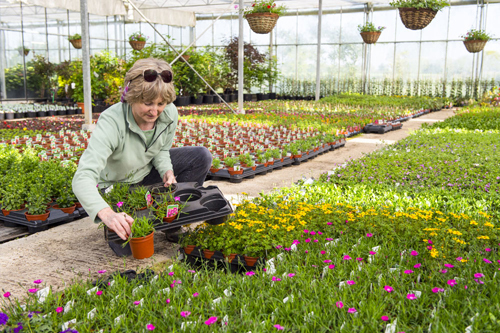 Finally, when heading to the local nursery take your time, plan in advance and go for colors & varieties. 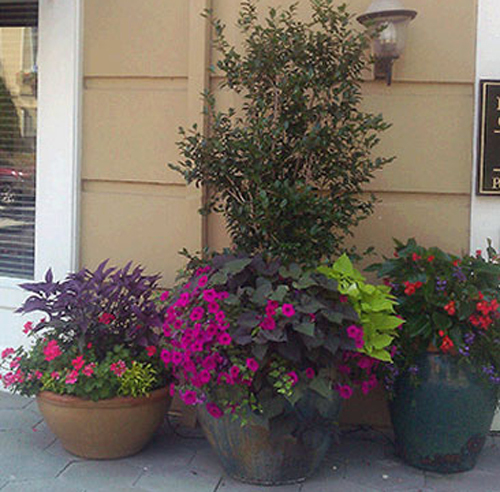 That way you will create successful potted planters that you can be proud of all season long. 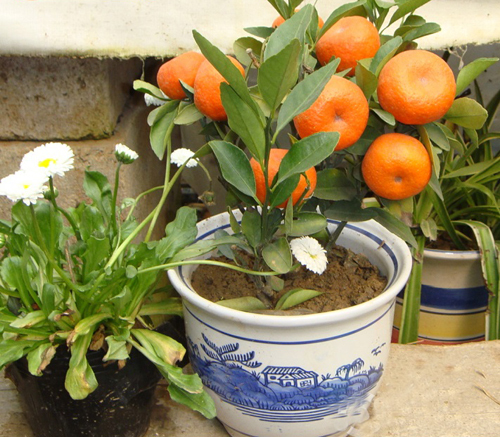 Purchase small clay flowerpots. Of course you can get them from us or any craft store. Paint them with an acrylic green paint. It may take 3 coats to get them covered because you want a bold bright green. Wrap a black ribbon towards the bottom of the clay flowerpot. 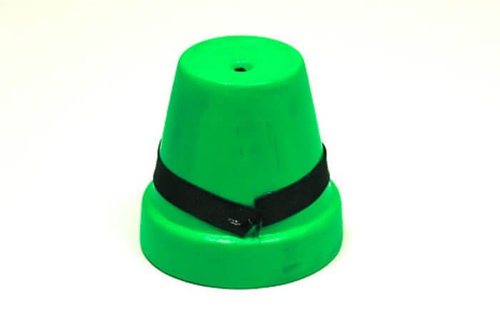 Since the pot is not a true cylinder, you will have to adjust in the back to the ribbon to sit properly in the front. 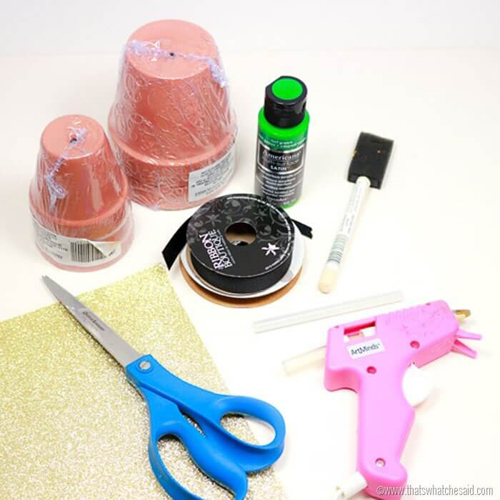 Use a hot glue gun to secure the ribbon in place. Next use an Xacto knife to cut out the buckle. Use gold card stock and hot clue in place. Now we know it's hard to believe but that is it. Think of all the fun things you can do with these hats. Place one at each place at the dinner table. 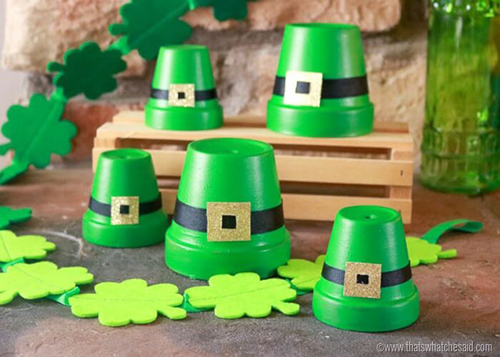 Stack the pots on a living room fireplace mantle and decorate with clover. Place them around the house and put a gold candy coin under each one and use them like a treasure hunt. The whole idea is to have fun and be creative. 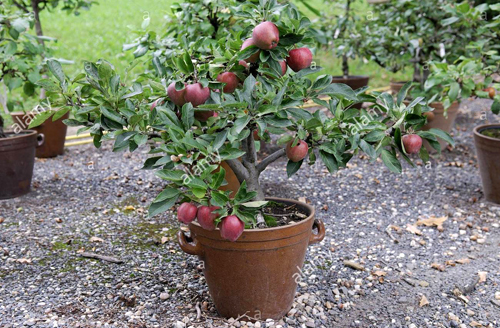 While growing flowers & veggies in planters can be easy, growing fruit trees & berries take a little more thought. You will need to become familiar with such things as root stocks, pollination, and climate control. We discuss all of those items in this blog post. 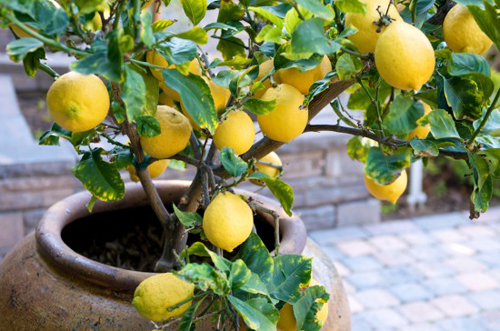 Growing your own fruit in a garden planter is really fun and rewarding. Nothing tastes better than homegrown fruit picked at peak ripeness. Imagine the pleasure of adding a handful of berries to your morning cereal or making an apple pie with fruit from your potted tree. 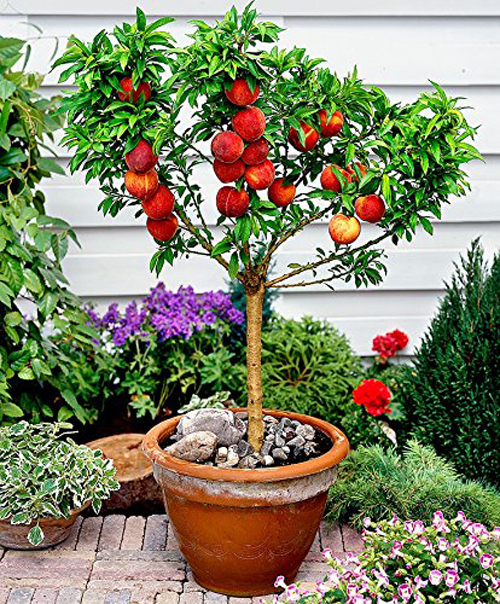 Many types of fruits and berries adapt nicely to growing in containers. Plant breeders continue to develop compact varieties especially suited to garden pottery, and they have many advantages as well. Probably the most important point is the mobility that container planted trees provide. If frost threatens, you can move your fruit trees under cover for some protection. Before you get started on this fun adventure - you need to learn a few fruit gardening terms and concepts that will keep coming up. Remember how pollen moves from the male part of the flower to the female part, fertilizing it and causing fruit to grow? Well some fruit trees like Peach have compatible male and female flower parts. This means if you plant a peach by itself it will produce fruit. Other fruits including apple & blueberries produce more quantity if they are cross pollinated. This means they receive pollen from another variety. You can still grow one blueberry or apple plant and get some fruit but you will get a lot more if a different variety grows nearby. The root stock is the below grow portion of the plant. The scion is above ground. If grown on their own roots get huge. Much to big for a container. But, if grown on dwarfing root stocks they are ideal for planters. When it comes to selecting planters make sure they are large enough with a drain hole in the bottom. In fact the more holes the better. You don't want to be re-potting your trees every year. 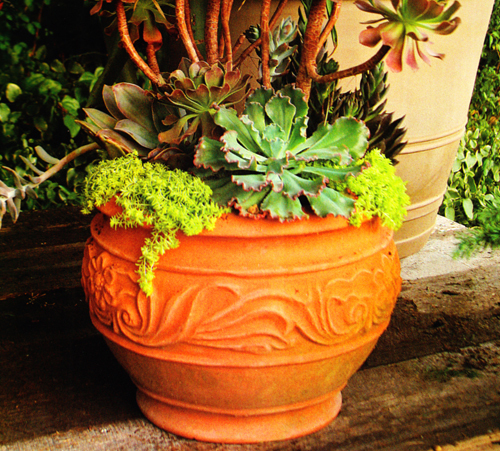 Terracotta is always best because it breathes and is the best for air circulation around the roots. 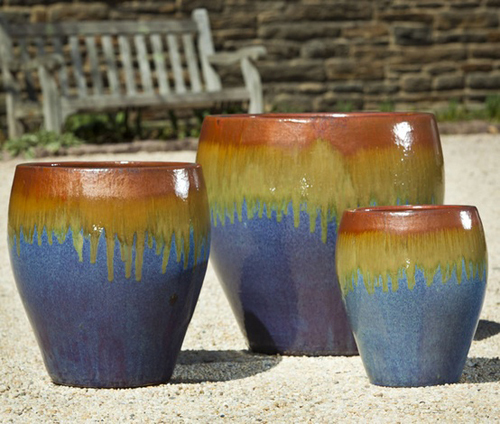 However, terracotta is meant to break down over time so it never hurts to go with a glazed or high fired planter. 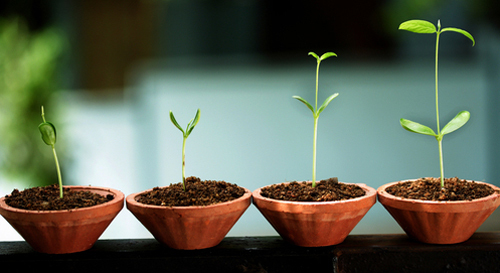 [Read More] Can you grow a banana tree in a pot? [Read More] Create a outdoor living space! 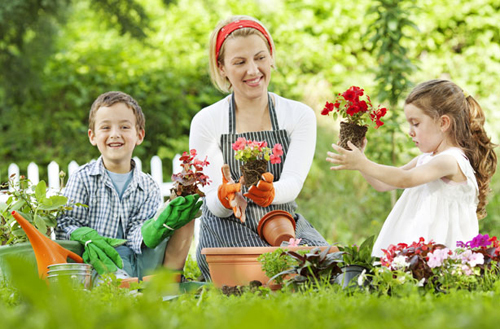 Gardening isn't just for adults. There are a few things kids love more than digging their hands into the earth, watching flowers bloom and spending some up close and personal time with creepy crawlies. Take a look at your garden inventory. Are all your garden tools adult size and to dangerous for small inexperienced hands? 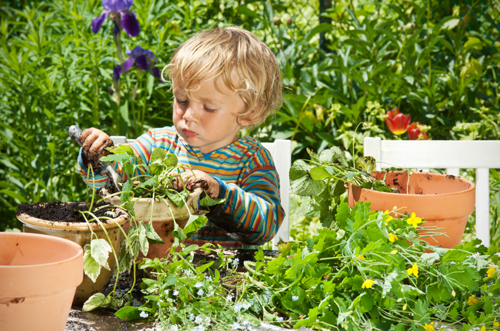 Then create a kid zone of garden items, that your little ones can play with. Other kids something different than the latest doll or video game. Kids tools sets, contain shovels, hoes, rakes, aprons, tote bags and gloves specially designed to fit and appeal to small children. They also make great gifts. They are safe and easy for them to use. Children with vivid imaginations and zest for life, will love items such as butterfly garden sets or building a birdhouse. Get your kids outside away from the television. 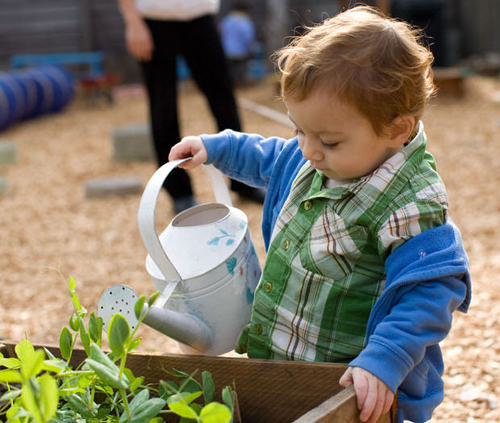 Let them use the hose or watering can to water plants, let them plant their own garden in a flowerpot but first taking them to the nursery and letting them pick out their own seeds or plants. Check out the soil and get a small bag of potting mix. Lastly let them choose a wonderful flowerpot that they can call their own. If you want to get crafty you can let them paint a clay pot with acrylic paint and they can put their name on it or their favorite bug. Once they plant in it let them put it in their bedroom and teach them to become responsible for watering. Basically kids just want to be with you doing something fun and exciting and playing with garden tools. Do your part. Art on the patio or in the garden. Why do artful objects - such a sculptures, architectural artifacts, and birdbaths or empty garden urns have such an impact in the landscape or garden area? Well, it's like adding jewelry to a little black dress or a few bright pillows to a tired sofa. Art or ornamentation improve the garden's composition. Garden decor should provide delight but it shouldn't complete with your plants. A well placed sculpture adds to the appearance. They communicate volumes about the gardener's own tastes & styles. While there is no right or wrong in something as subjective and personal, the general rule of scale and proportion, placement and balance are useful guidelines. Think of scale as the heft of materials, shapes and forms, in relation to your home. For example a Victorian style home is often feminine in feeling with delicate touches. A contemporary home is more geometric and bare. Each of these styles requires compatible ornamentation in our around the garden area. Where you place your artwork says a lot about it's role in the landscape design. A blue glazed ceramic garden planter might be fine at the bottom of porch steps, but looks fantastic when place in a shrub area where it's posed again dark green plants. Stand in the yard, use your eye as a guide. Is there a bare spot under a green shrub? Why not place a garden animal statue like a bunny or bird. You need color by the pool but don't want leaves falling into the skimmer. How about a tall colorful cigar jar with nothing planted inside. Displayed as a piece of art it is stunning. 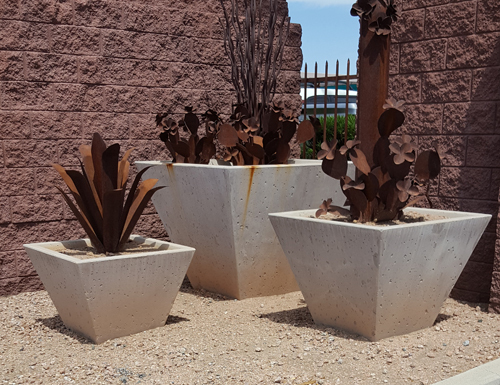 Lastly even though you can fill your garden & patio areas with all kinds of birdbaths, pottery, garden statues or more you also need to pay attention to the types of plant materials you use. Instead of the usual types of plants try grasses, & bamboos. There are so many different kinds of unusual items to plant with. And, remember that smart designs require restraint. Even if you like a particular plant or type of garden planters keep some restraint. Try to eliminate clutter! 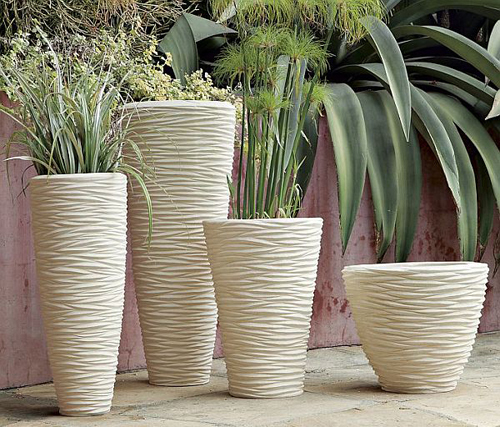 Well placed objects will enhance your gardens' beauty and reflect your personal style. [Read More] How to divide plants. [Read More] Houseplants that clean air.